WNBA Draft 2018 is just a day away as the league gets set to welcome its newest members to an exclusive club in the premier women’s basketball league in the world. 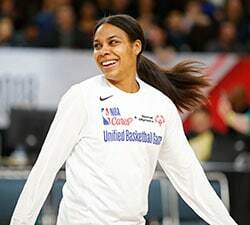 Here are five of the top storylines to watch play out on Thursday night, with insights from ESPN analysts Rebecca Lobo and LaChina Robinson and a trio of coaches that hold the top four picks – Las Vegas’ Bill Laimbeer, Chicago’s Amber Stocks and Indiana’s Pokey Chatman. One of the best things about draft night is the unpredictability of the event. Who is going where? Which team made a surprise pick? Are any trades going to take place? Which team got a steal as a talented player unexpectedly fell to them? While this draft should have plenty of that intrigue, it will all play out after the No. 1 pick as South Carolina’s A’ja Wilson is a virtual lock to hear her name called first. Laimbeer wouldn’t go so far as to guarantee it, but he left a pretty good hint that he knows exactly what he’s doing with the pick he’s held since the draft lottery. Taking Wilson with the No. 1 pick is the easiest decision of the night for good reason – she swept the national player of the year honors thanks to a dominant senior season in South Carolina and has the body and skillset that will translate very well to the pro level. “I think she’s ready for the pros right now,” said Lobo. “A’ja is such a unique talent in terms of her size and skill set. She’ll continue to grow and she’ll continue to get better. She’ll expand her game. "A'ja Wilson is gonna be a beast." 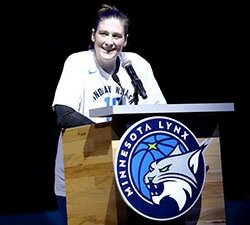 “You don’t get many players that can drive like she can,” added Laimbeer. “She can attack the basket with one dribble and cover a tremendous amount of ground. It says something that when you have a player of her size take the ball out of bounds all the time where the trust factor is there for her to make the right pass. She’s also the player who comes back to get the ball and is the outlet pass to start, whether it’s a press break or get the ball in, because she’s going to make the right decisions. Those are the intangibles you look for in a player. And also, her shot, she shoots from an elevated position above her head so you don’t have to worry about shot blocking. Connecticut junior Azurá Stevens made headlines last week when she announced her decision to forgo her final year of college eligibility and enter the WNBA Draft. Stevens played just one season at UConn after spending her first two seasons at Duke. The 6-foot-6 forward with guard-like skills may have the biggest upside of any player in the draft. With that said, her decision to enter the draft has shaken up many team draft boards near the top of the first round. Lobo said her expectations at the No. 2 pick changed as soon as the word of Stevens’ decision came down. 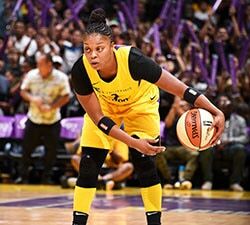 “My expectation, until Azurá Stevens entered the draft, [the Indiana Fever] would for sure go with Kelsey Mitchell,” she said. “But now with Stevens in the draft, I wouldn’t be surprised if they went with Stevens. Of course Stocks’ decision depends on what Chatman and the Fever choose to do at No. 2. One advantage of the 2018 draft class is the diversity of talent. From playmaking point guards, to elite perimeter scorers, to 3-and-D wings, to versatile forwards and centers with size and skill, there are impact players at every position available to fill the needs of all teams. The 10 players that will be in attendance on Thursday illustrate that diversity well. There are strong point guards in Jordin Canada and Lexie Brown, great perimeter scorers like Kelsey Mitchell and Victoria Vivians, versatile wings like Diamond DeShields, Gabby Williams and Kia Nurse, athletic bigs like Monique Billings, and the aforementioned Stevens and Wilson. Here are a few thoughts from the analysts and coaches on just a few of the players that will be New York City on Thursday. Victoria Vivians: “A lot of people really like Victoria, I think, because of her size. Big guards are at a premium in the WNBA. And her ability to score,” said Lobo. “And not only her efficiency increased this year, but the dramatic increase especially when it comes to her three-point shot, from shooting 20 something percent to up to close to 40. Jordin Canada: “Is there a player that’s more fun to watch than her?,” asked Robinson of UCLA’s point guard. “She can lose a defender off the bounce, no problem. Very classy. She can penetrate the defense, find the seams. She’s got the next-level quickness. Not a pure shooter, meaning I don’t think she’s thinking about shooting the three every time she touches it, which is a little bit different between her and Lexie. Kelsey Mitchell: “That’s a great accomplishment,” Chatman said of Mitchell’s 3,402 points in college – the second most in NCAA Division I history behind last year’s No. 1 overall pick Kelsey Plum. “So many players come into our league with that, and it really is great for the publicity and the pat on the back. Certain things that we’re looking toward is an ability to make other people around you better, speed and quickness, separation. IQ items. “I would agree,” added Stocks. “It’s a completely different game. Kelsey is a talented player. She’s going to do a lot of things very well. She’s going to create some baskets. Now, she’s going to have some showtime moments. There’s no doubt about that. But will that be consecutive possessions, consecutive games, consecutive crunch-time plays? Not likely. But she’s a talented player. Every player that is selected on Thursday night will begin her transition to the WNBA. Most players are coming directly from college and will have to add the life transition that happens from being a student to a working professional as well. Of course, there are exceptions like DeShields, who played professionally in Turkey last year in lieu of returning for her final season of eligibility at Tennessee. Plus, there are international prospects like Russia’s Maria Vadeeva, who has played professionally overseas for years already. “Size, strength and speed are where the WNBA is head-and-shoulders above college basketball. These players are grown women. They’re physical. They know how to play basketball,” said Laimbeer. Teams have less practice time in the WNBA compared to college, especially this upcoming season, where the schedule has been condensed in order to complete the season ahead of the FIBA World Cup. There will be 36 players selected on Thursday night, but there simply aren’t 36 jobs available for those players to fill. With 12 teams each with 12 roster spots, that’s 144 jobs in the most competitive women’s basketball league in the world. Only the game’s elite even make a roster, let alone get on the court and make an impact as a rookie. Most teams holding first round picks will look to fill a need or add a player that they feel can add depth to their roster this season. But something that will be key to watch is what happens in the latter rounds of the draft. This is where teams can take a chance and try to land a steal that may not come to fruition for a few years. The draft is not only about taking the very best college players in the country; it’s also about finding the diamond in the rough. Maybe it’s an international player that not everyone has scouted extensively yet. Maybe it’s an injured player that would go much higher in the draft were she healthy on draft night. Will a team be able to get a lottery-level talent late in the first round? That would be a steal. Then there is a player like Baylor’s Kristy Wallace, who tore her ACL in February and will be out for the year. How high would she have been selected had she been healthy? Which team can afford to use a pick on her in the latter rounds of the draft and wait for her to recover and join the team? “Kristy was having a terrific senior season. I think in particular when you focused on the games that they played against Texas, she was the difference in helping Baylor win both of those games before she was injured in the regular season,” said Lobo. “And she’s intriguing because she’s got good size for a point guard. She’s got a real toughness that she’s shown about her. She has an ability to score not only from the perimeter but drive into the paint and finish. Getting her teammates open. Think back to Tamika Catchings, who was taken with the third pick in the 2001 draft but didn’t make her WNBA debut until 2002. Even last year’s draft saw Alaina Coates selected at No. 2 overall after suffering an injury late in her senior year. She will debut for the Sky this year, giving them another young talent to go with their two lottery picks.